Tram or S-Bahn in German. Vienna has great public transport. 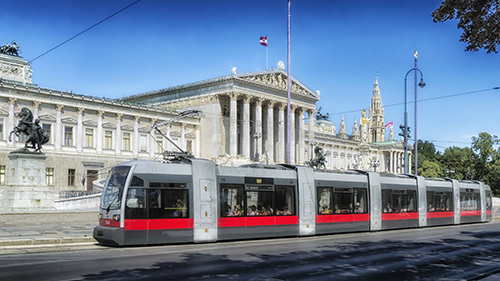 The “Wiener Linien” tickets include the tram (S-Bahn), subway (U-Bahn), and buses inside the core zone (which you will only leave if you travel beyond the subway system). For planning your trips we recommend the iOS and Android apps “qando Wien” or “WienMobil“. Alternatively, Google maps just added support for the Viennese transport system. Google maps do not provide public transport trip planning in Vienna. Tickets can be bought in any subway station, inside the trams or with the bus driver. You can also buy tickets using the Wiener Linien app on iOS and Android. Note: some tickets need to be validated when entering, the subway station, bus or tram. Single tickets can be purchased at a price of EUR 2.20. A single ticket is valid for traveling one way in one zone. You may change to different lines in the course, but you may not interrupt your journey. The city of Vienna accounts for one full zone or core zone (Kernzone or “Zone 100“). We recommend to get a weekly ticket for 16.20 Euro. It is valid from Monday 9:00 AM to the following Monday 9:00 AM. It does not matter if you purchase it on any other day of the week, it will be valid from the last Monday before the day of purchase to the following Monday. Another option is the 72 hour ticket, which costs 16.50 Euro, but is valid from the time of purchase until 72 hours later. There are 48 hours (13.30 Euro) and 24 hours (7.60 Euro) tickets too. For comparison a single, one-way trip costs 2.20 Euro. If you need a ride you can either call a taxi or go to one of the many taxi stands all over Vienna.